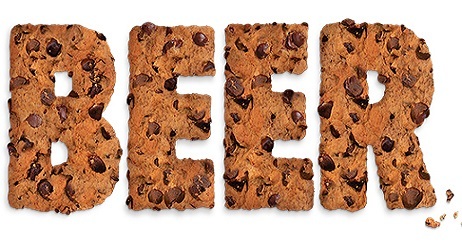 In honor of #NationalCookieDay we offer up these cookie-inspired #MiBeer options for you! Nutter Your Business (Peanut Butter Stout) from Grand Armory Brewing Company in Grand Haven tastes like your favorite proprietary cookie. Oatmeal Raisin Cookie from Beards Brewery is available in draft only at the Petoskey pub. This Amber ale brewed with all of the fixings of a great oatmeal raisin cookie: raisins, oatmeal, brown sugar and cinnamon. Look for Oatmeal Creme Pie from Pigeon Hill Brewery in Muskegon in cans around the state. Savor Dunkel & Deep Fried Oreo from Frankenmuth Brewery. This classic Munich style Dunkel Lager is a five-grain beer, smooth and light bodied. It even won the Gold Medal in the Dark Lager category at the 2016 World Expo of Beer. Because the holidays are for rockin’ out while eating cookies, Arbor Brewing Company in Ann Arbor delivers Bake Sale–a full bodied double milk stout brewed with with molasses, lactose, cacao, cinnamon and vanilla bean. Liberty Street Brewing Company’s Windmill Cookie (aka Fall Shandy) is the Pun-Kin Pie Ale with a splash of our house made root beer, resulting in an increased spice character that is identical to the Windmill Cookies with the slivered almonds in them. The cookies are difficult to find, but beer is available through the fall season and into winter at the Plymouth pub. Releasing today (December 4) is Nana’s No Bake Cookie Porter from Trail Point Brewing Company in Allendale. Made from Peanut Butter, Chocolate and Oats, it is just like biting into one of Nana’s famous no bake chocolate-peanut butter cookies. Naughty Girl Stout from Right Brain Brewery in Traverse City is deeply flavored, yet refreshing and cooling. This sensual, full-bodied stout combines rich chocolate flavors with an infusion of Biodynamic Peppermint from Light of Day Organics in Traverse City. Customers at Brewery Terra Firma in Traverse City say their Ancho Chili Dutch Double Chocolate Porter infused with oranges and cinnamon tastes just like a cookie. The Snickerdoodle Porter at Arclight Brewing in Watervliet tastes just like a cookie in a glass.